​Sue is a passionate photographer, whose love for this art form has grown and evolved since studying a Diploma in Photography at Ucol Palmerston North New Zealand. Since this time, Sue has gone on to win numerous awards, self publish her own books and achieve "honorary membership" of the Photographic Society of New Zealand. Sue continues to explore the different genres of photography and develop her own style. Being a keen traveller and interested in the environmental challenges being faced in many remote parts of the world, Sue has developed a focus in her work endeavouring to capture the relationship between the natural environment and the various plant and animal species that choose to live there. 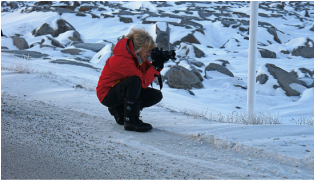 Sue enjoys the never ending story of discovery that photography provides and the opportunity to inspire others, share her experiences and invite conversation. ​When not travelling, Sue can be found photographing in her favourite part of the world, the beautiful Marlborough Sounds of ﻿Aotearoa.